***Update 2/23/2012*** App was finally approved for the iTunes App Store. Check out the Password Crafter product page. The long road to try to make a living developing mobile apps has almost officially begun and I’m in the process of putting the finishing touches on my first iPhone/iPad app. As I previously wrote I decided to get back into programming and decided to focus on building mobile apps. To ease into it, I decided to start out with something simple and something I could use. So about two weeks ago I started working on an app that could generate random passwords. I felt this was a good idea because it is something I could use in my normal day job and would be easy enough for me to get use to the iOS specifics. 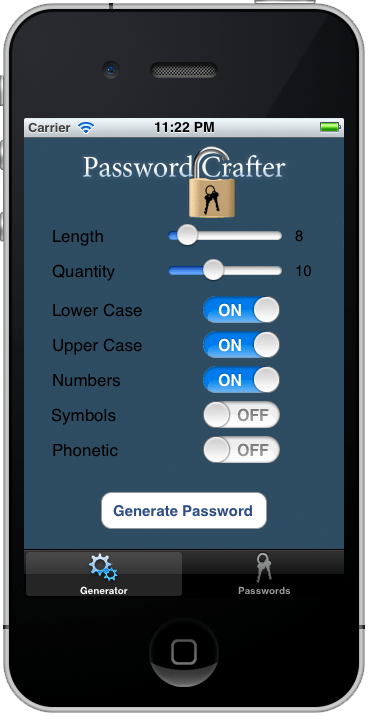 Screenshot of my first iOS App, Password Crafter. Hopefully will be on the iTunes App store before too long! I know that there isn’t a high demand for this type app and there are tons of similar apps already in the iTunes App store, but I’m not expecting my first app to be a blockbuster. I also felt I could add a feature that I didn’t find in the current apps. Pretty much all password generators use a combination of letters, numbers, and symbols to construct a password. This is pretty basic and simple and is the reason you see so many of these apps. I thought I would make mine a little different by allowing you the ability to choose how many passwords you wanted to generate. This way you could scan through the list and choose the one you like best. The main feature I added that I noticed many didn’t have is the ability to create phonetically sounding passwords. Most people have a hard time remembering randomly generated passwords, but by making phonetically sounding passwords it should help them be more memorable. To make sure that the passwords are still secure it isn’t just a bunch of words you can find in the dictionary. Instead it constructs pronounceable segments and combines them to form a password you can sound out. This combined with being able to specify multiple passwords gives you the option to go through the list of generated passwords and pick out the one that you find most memorable. I’ve been working hard the past two weeks to try to really get into the programming swing. I’ve worked on this app, the game app I’m creating with some friends, and then of course have my normal day job. I’m hoping to have the finishing touches done by the middle of next and then I’ll submit it to the app store. When it will be up on the store will depend on the approval process. I’m hoping it will pass all the checks on the first submission and will be up fairly quick. If this sounds like an app you could use or you just want to help a beginning programmer out, check back to see when it is officially released and makes it on the iTunes app store.